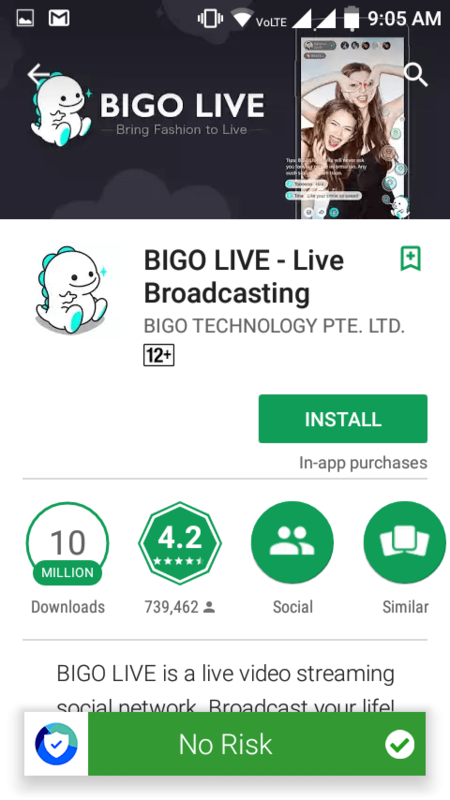 Bigo Live Guide: this is one of the trending and growing application in the social media category.Using this application, we can conduct live videos and share our talent, and also we can make new friends.In this article, I am going to cover how to use bigo live and way utilize this bigo live app.and also I am covering how to get unlimited diamonds using unique way. 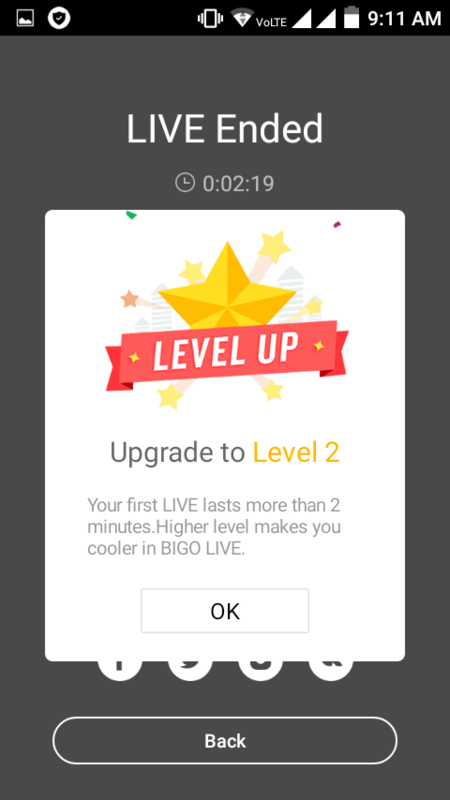 most of the peoples don’t know how to use bigo live PC that why I decided to share this guidance with you.if you follow my steps damn sure you will become a start in bigo live. first we need two things that are the internet and some space to store this application if you already have this then cool! 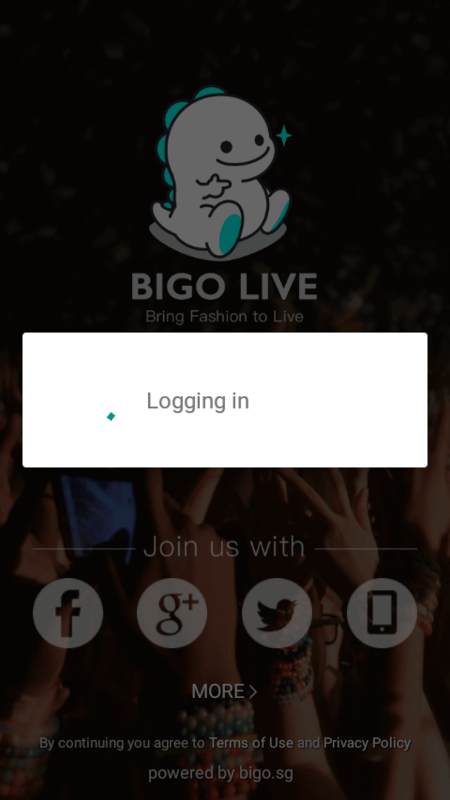 .follow below steps to Download bigo live pc app. 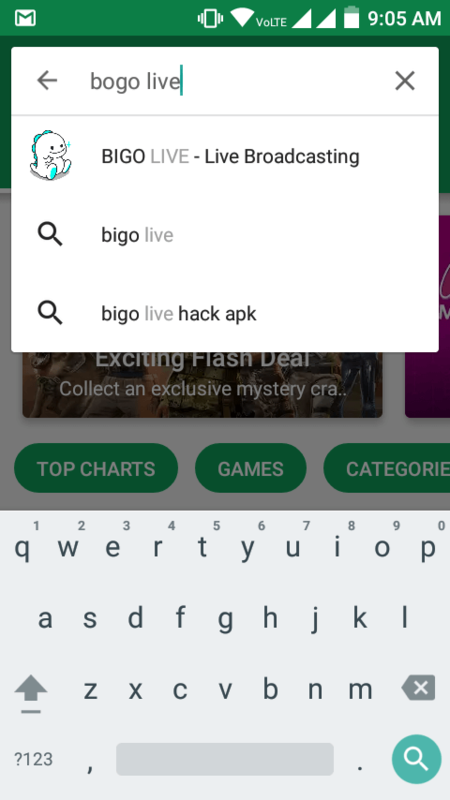 Open your android phone then go to google play store type bigo live like in the picture. Then select Original App you can easily identify after seen below picture. Now this application Size more than 17+MB so its take time to download this application.after successfully completed this application then its will show like below image. After open this application we need to register.without registration we cant get access to this application.so for register this application we can use any other accounts live Facebook,google+.Here I used google+, and you can use any from that options. In above image, we can see what the options are there to register bigo live.So you can use any from that list.After signup, you can able to see how many members are doing bigo live like below images. Now you can see 3 Options in above images Middle one is used for do live first one is used for who is doing now bigo live.The last one is you can check other peoples how many diamonds, beans, and followers they were having above images now Barbie Sheik is doing live she is from Mumbai India. Like that, we can watch other persons live streaming without they permission. You need to worry about this I already said earlier I ll explain everything in this article now learn how to start to live in bigo live. 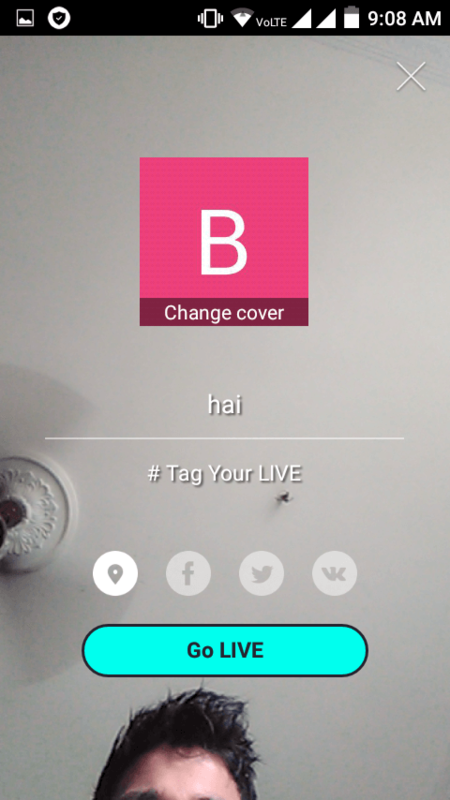 Click On center button on bigo live app.the it will show like below image. In above field, we need to enter few attractive title or attractive word. Because it will help to get more beans and diamonds and event also most of the chances to watch your live more peoples.So try to add some interesting words in that empty box.then every thing is ready to start to live then click on GO Live option.Wait 2seconds your live will start.After your live start, it will look like this. 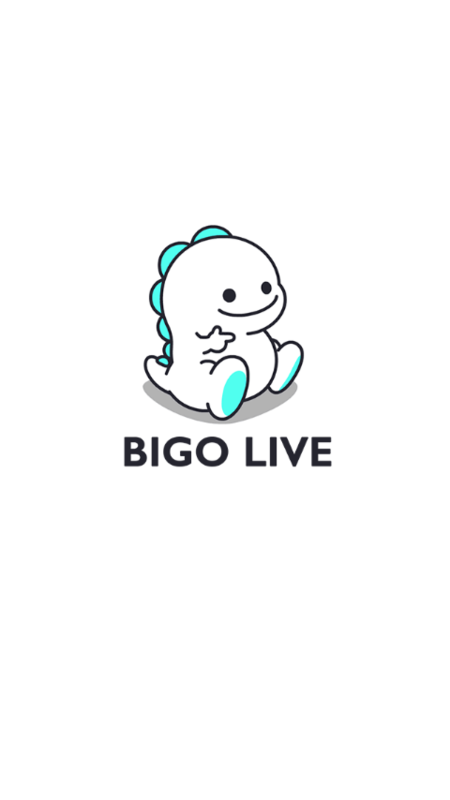 In above picture, you can read some rules and regulation to use bigo live long.just read above picture words.after that you can see how many peoples are watching your and how many starts and beans you got.if you got more live watcher, beans and diamonds then surely you will become a big start with the help of bigo live application.many peoples are started using this application to show they talent and increase fan fallowing.after you live ended you will get detailed information regards you did live once have a look at below image. Above you can see, I did only two minutes video suddenly I crossed level one. Now I am level two person.how I crosses my level you can check below images for beans and diamonds. 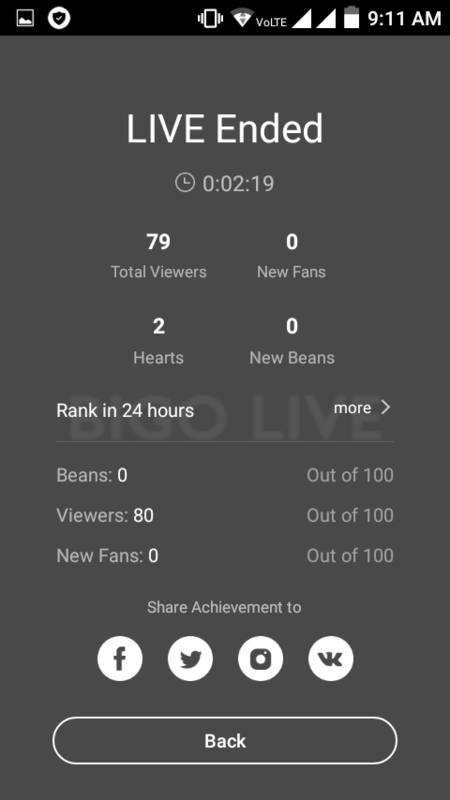 Total 80 Live views I got and two heart also bit time is bit low.this is the main reason to reached level 2.so guy try to do more lives with unique and with attract.Sure you will become a start. here I am telling my personally I am using way.Its is working to me so that why I am revealing this process.So guys try to understand clearly what I am saying. Tip1#use Girls pictures, Stylish or Attractive Images its will surely increase live viewers. Tip3# use the microphone and talk with your followers its will helps to increase your followers. Tip3#Try to start conservation and replay answers for their asking questions.its will help to stable your live viewers. This method I am using now I have 1000 beans,1200 hearts and 200+stars still its increasing :).hope this article cleared yours all about and confusions.if you like how to use bigo live application article the do not forget to share this article on Facebook. Please open my account. [email protected] thanks.